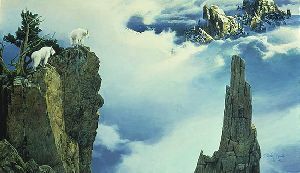 End of the Ridge - Mountain goats by Stephen Lyman, available from Prickly Pear Galleries. Artist Stephen Lyman was inspired by wildlife and wilderness and nowhere more than in his beloved Yosemite Park. There, he could climb the highest point of a crest at 11,860 feet and feel seated on a throne in a place where the universe seemed upside down, as though gravity were irrelevant and the sky around him became an ocean. No wonder Lyman’s muse, naturalist and conservationist John Muir, said that from these heights in Yosemite he loved nothing more than to dip his head into the sky. Print released 1983. Anniversary Edition giclee canvas released March 2010.